Hybrid couplers are four-port directional couplers that are designed for 3-dB (equal) power split. Hybrid couplers come in two types, 90 degrees or quadrature hybrid couplers, and 180 degree hybrids. Hybrid couplers are widely used in DAS and RF combining systems. 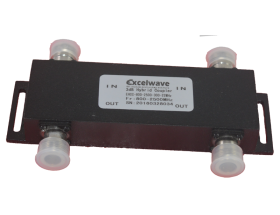 Excelwave Technologies designs and manufactures microstrip and cavity types quadrature hybrid couplers in 150-180MHz, 290-320MHz, 350-1000MHz and 700-2700MHz frequency ranges. Custom designs for higher power rating and other frequency bands are available upon request. Please contact your sales representative or send your custom request to sales@excelwavetechnologies.com.